In February, 2013 I got around to adding structures to the new centre modules on our Nottawasaga Model Railway club HO layout. I was looking for an inexpensive method of making industrial buildings to fit betwen the tracks. This meant scratchbuilding. One of our club members, John Houghton, had introduced me to Clever Models. These are textured templates that can be downloaded from the Internet or purchased on disk.John had built some paper building structures to fit over several switch machines and a Tam Valley board. 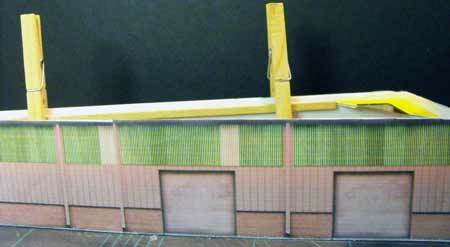 A Clever Models paper building can serve as a highly detailed mockup or can act as a permanent building on a layout. Even up close they look very authentic. I bought Volume 1: Steel Industrial Buildings. The textures can be printed from any computer or printer on 8 1/2" x 11" paper. The disk came with designs for large and small steel mill buildings, a car barn, critter shed, steel utility building, steel shed and quonset huts. More importantly for my purposes there were a number of steel texture sheets and paper building flats. I had an awkward rectangular space that needed to be filled. The building would be located alongside some turnouts so I didn't need a loading dock or even windows. I chose one of the texture sheets to make the industrial warehouse. Each paper building prints as a weathered structure which is pretty neat. You can purchase these paper building sheets in O, S, HO and N. Because you are printing them from a computer you can also scale them down. 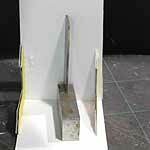 The only tools needed are glue, a steel straightedge ruler, a cutting mat, a sharp hobby knife and lots of #11 blades. Blades dull quickly when cutting cardboard and paper. Scissors and a burnishing tool are optional. 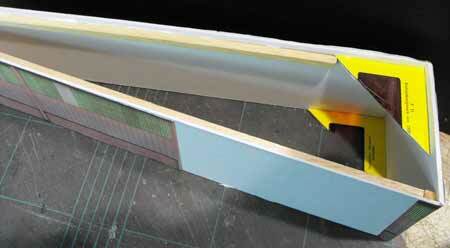 Clever Models recommends using ACC gap filling glue and various colours of felt markers to touch up paper edges. Different card stocks have different characteristics. The company recommends acid free, bright white smooth card with a matte surface. This type of card stock takes printing ink well with no bleeding or distortion. Three weights are used depending on the application: 60#, 90# and 120#. As the paper gets thicker it becomes more difficult to bend sharply. It depends what you can get your hands on and the kind of printer you have. Mine is only an ink jet printer that only accepts lighter paper. I could have taken the disk to a commerical printer to have the templates printed on thicker card stock but I didn't bother. I approached the paper building concept differently. I had bought some illustration board and thicker card stock to make a mockup of the building to see what would fit in the allotted space. I used that as the base for the structure and cut and fit the paper to it. I used 3-M spray adhesive to apply the paper to the card stock. I started by making the basic card stock structure. I used machinist squares to line up two walls to make a 90 degree corner. One of the tricks I learned some time ago was to cut Kodak 35 mm slides diagonally. This gives you a perfect right angle brace. Most people have some old slides kicking around some place. I have been digitizing old slides of the family so I don't need the originals any longer. I simply used some of the bad photos that didn't matter if I cut them up. Once I had the first two walls together I wrapped the paper template around the corner and spray glued it into place. A little unorthodox but it worked! This is how the paper building went together at this point. It was sort of hit and miss. The card stock was stiff but I braced it anyway. I used some more slides as braces and glued strips of balsa wood in the inside corners between the braces using white glue. I used wooden clothes pegs to clamp the bracing for the roof in place while the glue dried. I cut a piece of card stock to fit the roof by laying the paper building face down and tracing the outline from the inside. To make the building more interesting I added some roof details from a Walthers modular kit. Then I went over the top edges of the walls with a black felt marker. The roof was painted with Polly Scale weathered black. Some rust was dry brushed onto the various vents. This paper building will serve very nicely as a mockup. It may never need to be replaced! If you are looking to fill some layout space with "quickie" buildings, have a look at Clever Models LLC. You can make the buildings "as is" or do some imagineering to fit awkward spaces as I have done here. Go from "paper-building" to kit building overview. Go from "paper-building" to building flats ideas. Return from "paper-building" to my Home Page.